1-1-1 against TFC: What was going on? After losing to Toronto in May, the Philadelphia Union ran them out of PPL Park with a 3–0 win in July. On Saturday, they were fortunate to leave BMO Field with a 1–1 draw. What was going on? In each of the Toronto games, the Union enjoyed the lion’s share of possession. In the loss, they had 58.4 percent of the possession. After having 61.9 percent of possession in the home win, the Union actually had more of the ball on Saturday with 63.3 percent. Saturday was the third game in a row in which the Union enjoyed more than 60 percent of the possession, the fourth game in a row that they’ve had better than 50 percent. In those 4 games, they have a 0–1–3 record. As has become all too familiar, teams have grown content with conceding the Union the liberty to pass the ball among themselves, so toothless has been their attack. It is obvious that possession is in itself no guarantee of success. 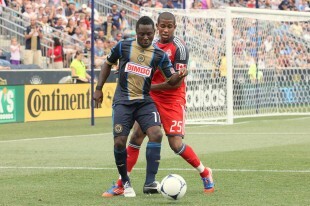 In the 13 games this season that the Union has more than 50 percent of possession their record is 3–6–4. When they have had less than 50 percent of possession, their record is 4–7–2. Put another way, the Union have earned 14 points when they have less than half of possession, 13 points when they have more than 50 percent of possession. The Union’s overall possession average for wins is 49.0 percent, 50.7 percent for losses, 53.6 percent for draws. The issue is, of course, a lack of goals. And you don’t get goals without shots, particularly shots on goal. Against Toronto last Saturday, the Union recorded but 1 shot on goal, which thankfully Sheanon Williams put past the keeper. It was only the 8th Union road goal of the season, the 2nd worst total in the league. If we look at where the shots came from in each of the 3 Toronto games, another issue comes into view. In the loss and the draw, Toronto was able to largely restrict the Union to shots from outside of the penalty area. In the loss, 8 of the Union’s 11 shots were from outside of the penalty area, none of which was on target. In the draw, 4 of the Union’s 7 shots were from outside of penalty area, none of which was on target. In both cases, shots are coming largely from center to right of the goal. In the win, only 2 of the Union’s shots were from outside of the penalty area. Meanwhile, the Union was peppering Toronto’s goal with 12 other goal attempts from multiple angles. So, in the win and the draw, it is largely chances from distance from one point of attack while in the win it is multiple chances close to goal from multiple points of attack. This in turn is connected to the Union’s crosses in each of the games. In the loss the Union attempted 26 crosses and in the draw they attempted 20. In the win, they attempted only 12. But they had more successful crosses in the win with 5, compared to 3 in the loss and 4 in the draw (one of which resulted in the late equalizer). So, while the Union had fewer crosses overall in the win, they were much more successful with an accuracy rate of 41.7 percent. In the loss the crossing accuracy rate was 11.5 percent, in the draw it was 20.0 percent. A glance at Freddy Adu’s passing stats in Saturday’s draw would seem to indicate an effective game: 31 successful passes and 6 unsuccessful passes for a passing accuracy of 84 percent. It is certainly better than the 67.4 percent accuracy he had in the loss and even better than the 76.1 percent accuracy he had in the win. But the passing stats only seem impressive until you look at them in detail. Adu appeared to start strongly enough in the first 20 minutes with 13 successful passes from 17 attempted. After going without a pass for nearly 9-and-a-half minutes, Adu has a brief flurry of activity between the 29th and 36th minute largely along the left touch line in the middle of the pitch. After that, outside of a single successful pass at the start of the second half, he then does not have a single successful pass until the 51st minute. After another nearly 7 minute spell without a successful pass, he records 1 short forward pass before disappearing for nearly 5 minutes, a short back pass near the halfway line. 4 passes later, 3 of which are on the edge of the center circle, and Antoine Hoppenot is warming up to replace Adu. Looking at the charts below of Adu’s successful passes, it is clear that he was confined largely to the middle third of the field where most of his passes are short and either backwards or sideways. Quite simply, Toronto bossed Adu out of the game. To underscore the point, Adu had 6 successful passes and 2 unsuccessful passes for a passing accuracy of 75 percent in the final third. But 2 of the successful passes were throw-ins, 2 were short corners, and 2 were short forward passes outside of the box and away from goal. Sure, any of these passes could have led to something but they did not. They are hardly the numbers you’d expect from someone who is on the pitch to be a play-making game changer. Though he had a lower passing accuracy rate in the final third in the loss, Adu was much more active, completing 5 passes from 15 attempts. Additionally, he attempted 9 crosses, 1 of which was successful. In the win he had 8 successful passes–3 of which were key passes—from 12 attempts with 2 successful crosses from 3 attempted. In Saturday’s draw he attempted only 1 cross, which was unsuccessful. Adu recorded no shots in the draw and one blocked shot from outside of the penalty area in the loss. In the win he had 5 shots, four of which came from within the penalty area, one of which resulted in a lovely goal. In a sense, it is easy to see his inconsistent play as symptomatic of the inconsistency that has characterized the team as a whole this season. Certainly, when Adu is on, the team is better for it. Sadly, this has too often not been the case, be it in the 3 games against Toronto or the season as a whole. Many Adu passes are to “escape” pressure, before he is stripped of the ball, or knocked down by a more aggressive opponent. Is is not just Adu problem, it is the whole team being satisfied with putting the ball on someone’s foot, rather than having their head up, looking for combination passes that will actually move ball into position to yield a SOG. Even Carroll often passes backwards as first option, rather than build up to an attack, in my opinion. You are right that teams are more than willing to let Union have their little passing drills and possession, as long as it is not in final third.